The mailers, the palm cards, the creepy robocalls—all will be but an afterthought come Tuesday night. However, the winners will be anything but. That’s why we take endorsements so seriously. As usual, The Forum is only providing editorial comment for the two local races: State Senate District 15 and Assembly District 23. Tom Sullivan is challenging State Sen. Joe Addabbo, Jr. (D-Howard Beach), the incumbent who has held the seat since 2009. Take a quick look at Addabbo’s lawn sign. “Experience that counts.” Succinct, yet eminently effective. And on point. Addabbo hasn’t just held the 15th SD seat over the last 10 years—he has worked for the people who live and work in the communities that comprise it. Just this year, Addabbo has consistently answered the call. When The Forum was receiving calls, emails and letters over the disgusting abandoned house sinking into Hawtree Creek, we rang Joe and said, “What can be done about this?” The house came down within the following 10 days. When the community was apoplectic about the pigeon waste an inch thick at the 84th Street underpass, we reached out to Addabbo’s office again. The senator told us he would personally look into it; the City Department of Transportation has rolled out the powerwashers and installed pigeon-preventing spikes with the promise of budgeting for netting next year. “Right now, small businesses [along Cross Bay Boulevard] are under attack by the Department of Buildings,” Addabbo reported Tuesday evening at the Howard Beach Lindenwood Civic Candidates Forum. The senator, who has correctly called small businesses “the lifeblood” of the community, has made this issue a priority, working with the City to get crippling fines reduced or dismissed so that the thoroughfare isn’t infested with abandoned storefronts like so many others across the borough. Out of a possible 648 Albany session days, the Ozone Park native and resident has missed just two. Addabbo has passed 16 bills in the most recent legislative session alone. That, in part, is why The Forum is picking State Sen. Joe Addabbo, Jr.
We’re relying on experience in the Assembly race as well. 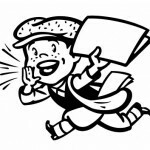 The Forum is advising our loyal readers to vote for Assemblywoman Stacey Pheffer Amato. While challenger Matthew Pecorino has mounted an admirable campaign, we need a proven fighter—and winner—in the lower chamber up in Albany. 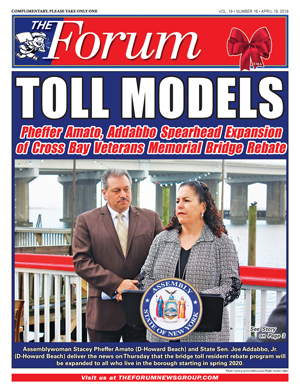 She went on to highlight several pieces of legislation that she has carried in Albany, most notably her bill that would prohibit the imposition and collection of a fare, toll, rental, rate, charge or other fee on the Cross Bay Veterans Memorial Bridge that passed the Assembly, 133-0, in June. We need Pheffer Amato in the Assembly for the next legislative session. We NEED her to see the Cross Bay Bridge vote through so we can finally rid ourselves of that albatross. Well, our time is up. Remember: Go with Joe and Stacey on Tuesday.